This video contains over 14 hours of lessons to help you become a better search marketer. 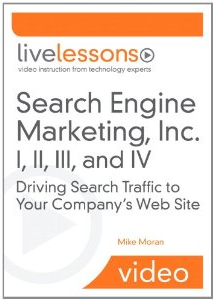 I recorded this video to accompany the second edition of Search Engine Marketing, Inc. book, now in its third edition. But it can also be a great introduction on its own, even without the book. So, if you just don’t consider yourself a reader, or you don’t have the time to slog through a 400-page book to improve your search marketing, this video series might be just what you need. You’ll walk through 20 separate videos that each help you with a key part of your search marketing program. Whether you are a new search marketer, or you’re just trying to get your existing program to the next level, these videos walk you step-by-step through a process, starting with an overview of search marketing, through how to succeed at search marketing in your business, planning your program, and finally, execution. Search Engine Marketing LiveLessons provides all the background needed to be a search engine marketer. You will learn how to systematically address every issue you’re likely to encounter, while helping you implement timeless strategies for delivering superior long-term results. Web Search Basics. Search and Your Marketing Mix. The Challenge of Search Success. Matching the Search Query. Ranking the Matches. Displaying Search Results. Finding Web pages for the Organic Index. Analyzing the Content. Building the Organic Index. The Searcher’s Intent. The Searcher’s Click. The Searcher’s Follow-Through. Web Sales. Offline Sales. Leads. Market Awareness. Information and Entertainment. Persuasion. Count Your Conversions. Count Your Traffic. Count Your Money. Target Your First Search Marketing Campaign. Assess Your Current Situation. Calculate Your First Campaign’s Opportunity. Choose the Scope of Your Search Marketing Program. Divide the Search Marketing Work. Choose Your Search Marketing Approach. Project Your Search Marketing Costs. Assemble Your Search Marketing Proposal. Sell Your Proposal to the Extended Search Team. Sell Your Proposal to Executives. What If Your Site Is Not Indexed? How Many Pages on Your Site Are Indexed? How Can More Pages from Your Site Be Indexed? The Value of Keyword Planning. Your Keyword Planning Philosophy. Step-by-Step Keyword Planning. What Search Engines Look For. The Philosophy of Writing for Search. Step-by-Step Optimization for Search Landing Pages. Why Search Engines Value Links. Your Linking Philosophy. Step-by-Step Link Building for Your Site. Paid Search Opportunities. Your Paid Search Philosophy. Set Up Your Central Search Team. Establish Search Marketing Best Practices. Track Search Marketing Success. What’s Web 2.0? (Blogs, Microblogging, Wikis, Ratings and Reviews, Message Boards). New Media (Images, Podcasts, Videos, Widgets). Social Media Listening. Tracking Social Media. Social Media and Search. The Disappointment of Web Site Search. The Importance of Web Site Search. The State of Your Web Site Search. Improve Your Web Site Search. What’s Next for Search Marketing? What’s Next for You?